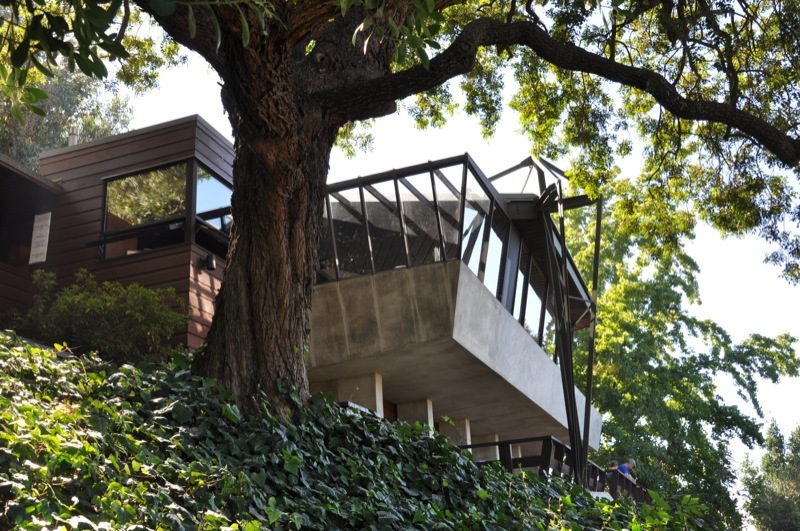 A few years ago, the John Lautner Foundation put on a really great tour of several Lautner homes, as part of the centennial celebration of his birth. I went on the tour and wrote up a few of those, but not all of them, on my old blog, Creatures of Prometheus. 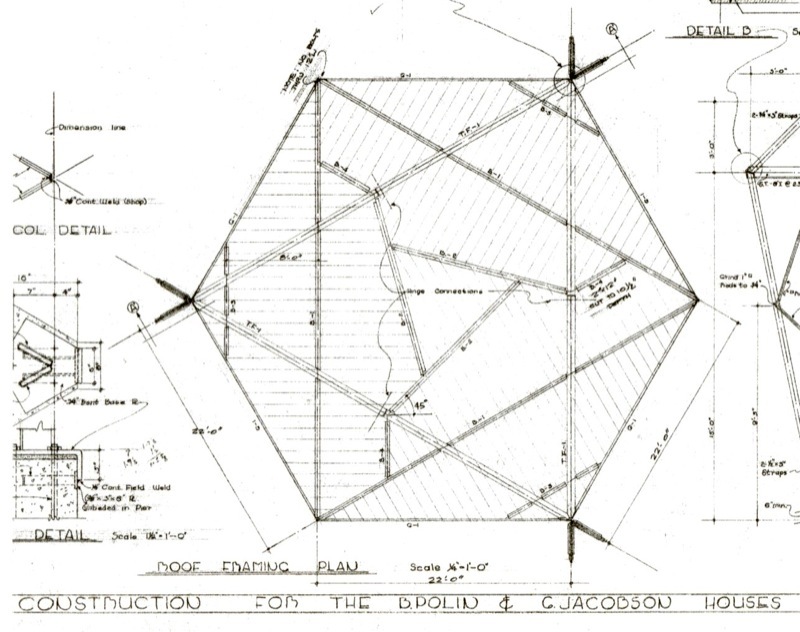 As part of our Building of the Week series, I thought I’d resurrect some of those old posts, and eventually write up the others here at Parson Architecture: The Blog. I fail to see how anyone could get too much Lautner! The Jacobsen is on Multiview Drive, just below Mulholland Drive, overlooking the San Fernando Valley above Studio City and Universal City. Multiview is a pretty good street for architecture; Schindler’s wonderful Kallis House, with its butterfly roof and quirky stone fireplaces, is nearby on the same side of the street. 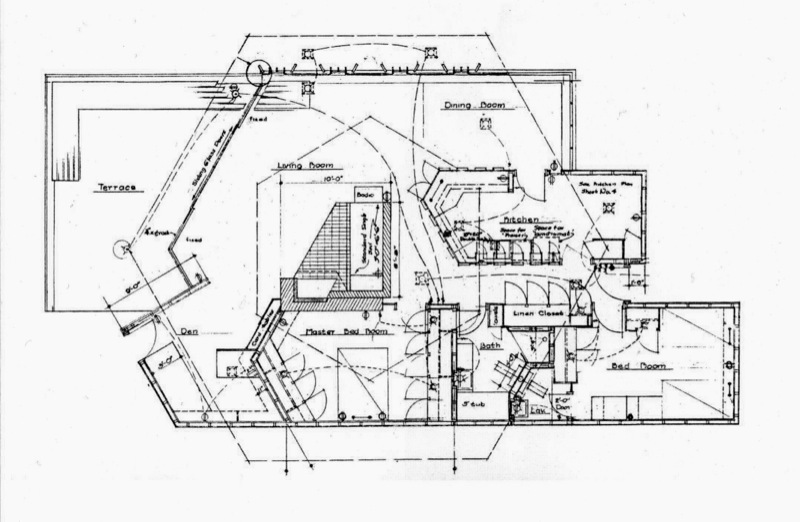 This is an early-career project for Lautner, dating from 1947. 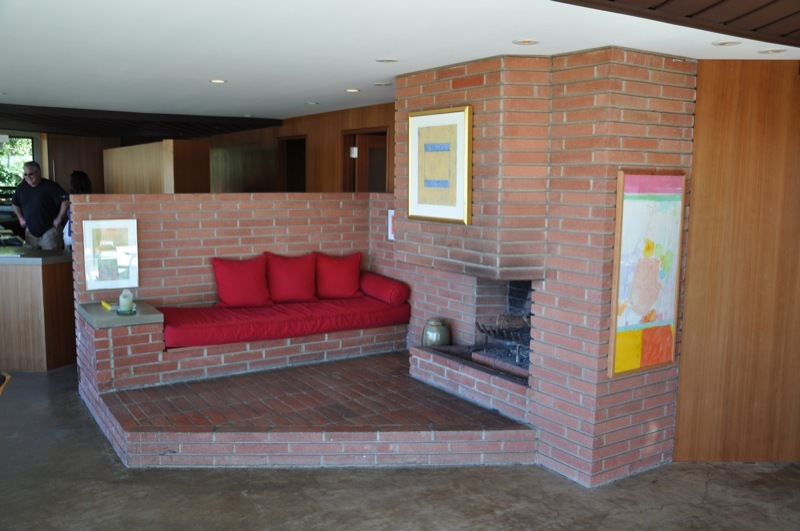 According to Wikipedia, he had left Frank Lloyd Wright’s employment and gone off on his own by that time, although he did not finally obtain his own architecture license until 1952. So, this house is the work of an unlicensed individual who would have found himself in violation of California law had he have claimed to have been an architect. Ahem. Don’t get me started. 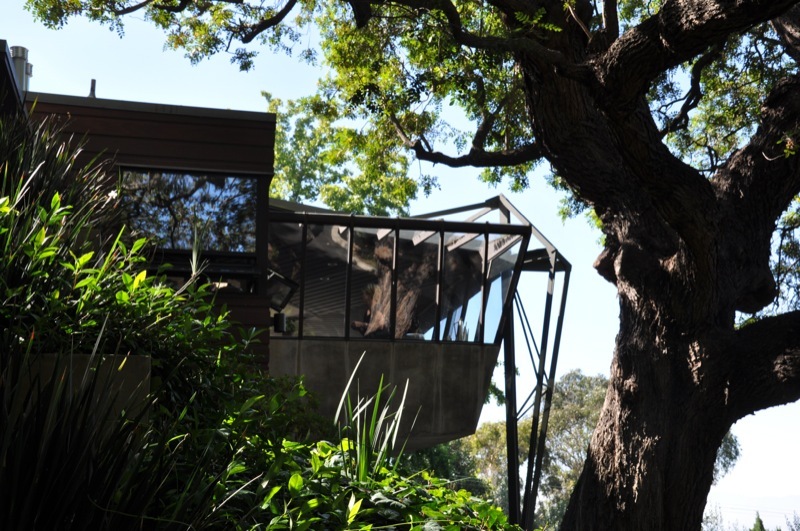 I love the way that giant tree frames the view of the house from below. So poetic! 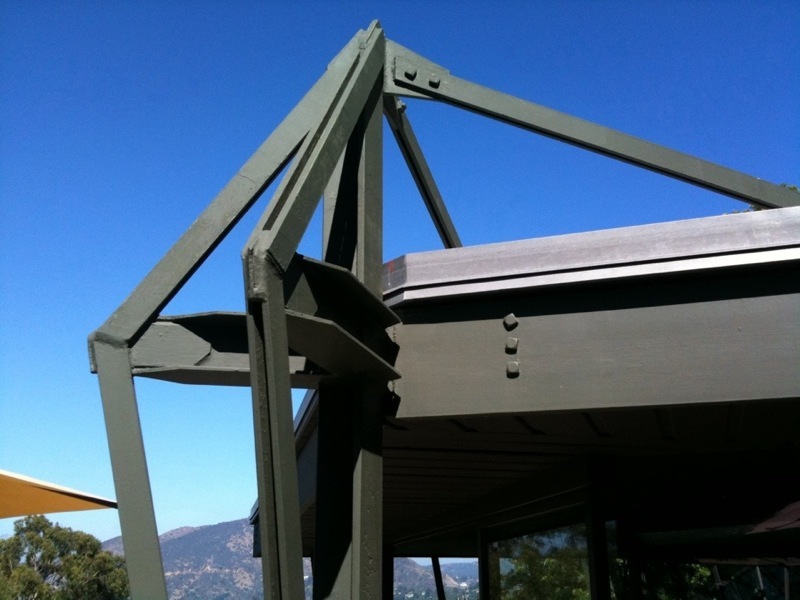 Other than being a boxy, modernist house, there is a really obvious feature that distinguishes this house from nearly all others you will ever see: the large steel truss that seems attached to the side of the house like some mechanical or insect-like appendage. 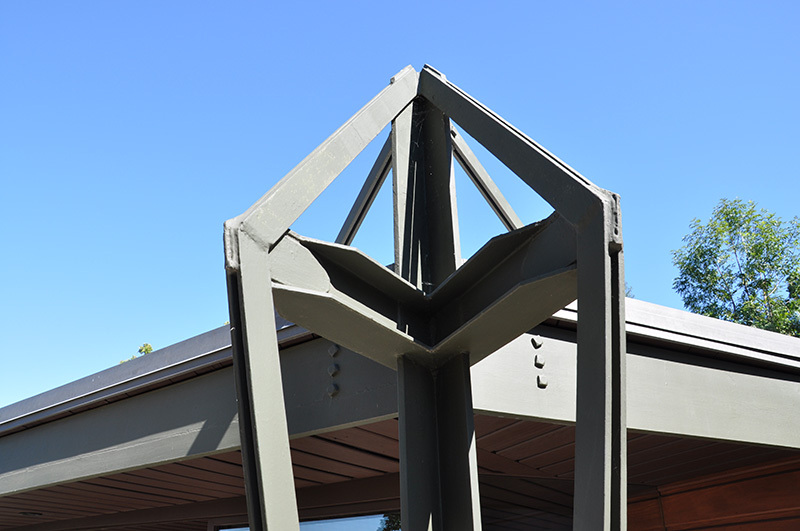 The truss is actually acting as a column and holds up the roof. The main upper roof is hexagonal in plan, and there are 3 of these truss-structures that support it. 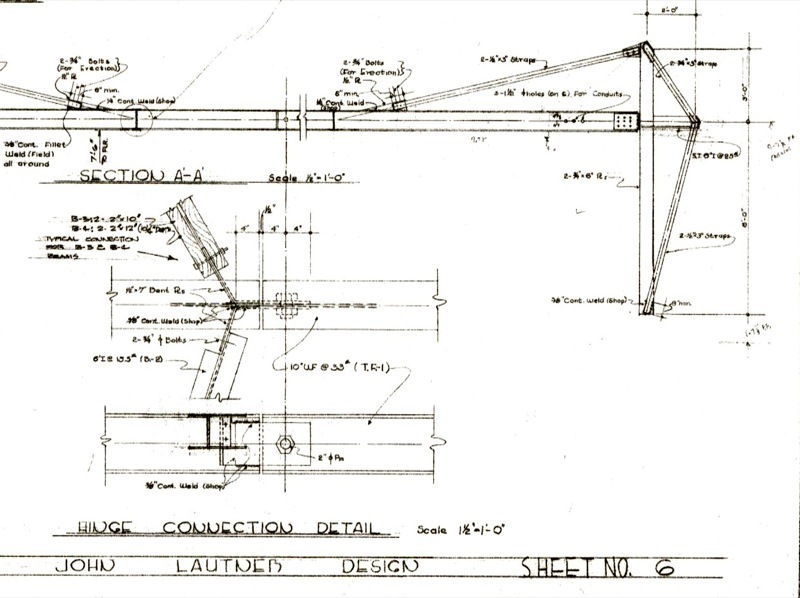 Here is Lautner’s roof plan, which gives you an idea of how it works. The 3 dark ‘V’s at the upper right, lower right, and left sides of the hexagon are the trusses. The truss on the left side, in the plan, comes down in the middle of the patio. 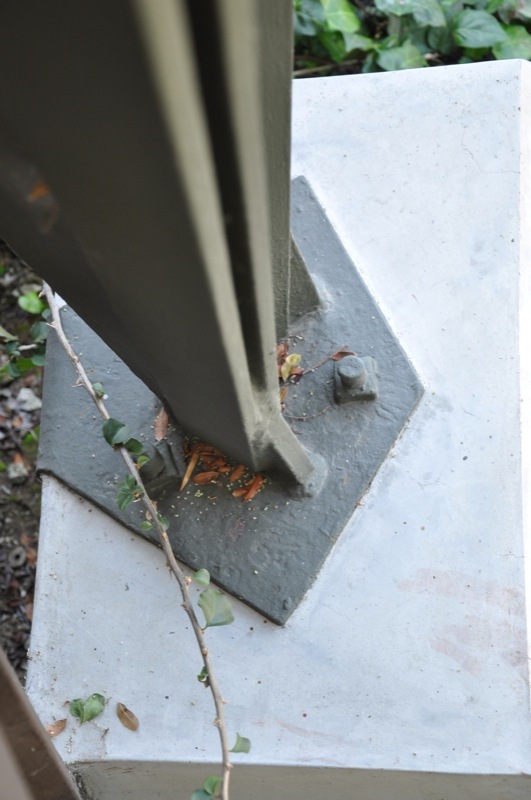 Here is Lautner’s detail of the truss. Notice it says “John Lautner Design” and not “John Lautner Architect” at the bottom. Even the base plates were carefully designed. They could have just as easily been dumb rectangles, but he shapes them. Lest you think this house is just all about the structural design, as if that weren’t enough, there are tons of beautiful details throughout this house. 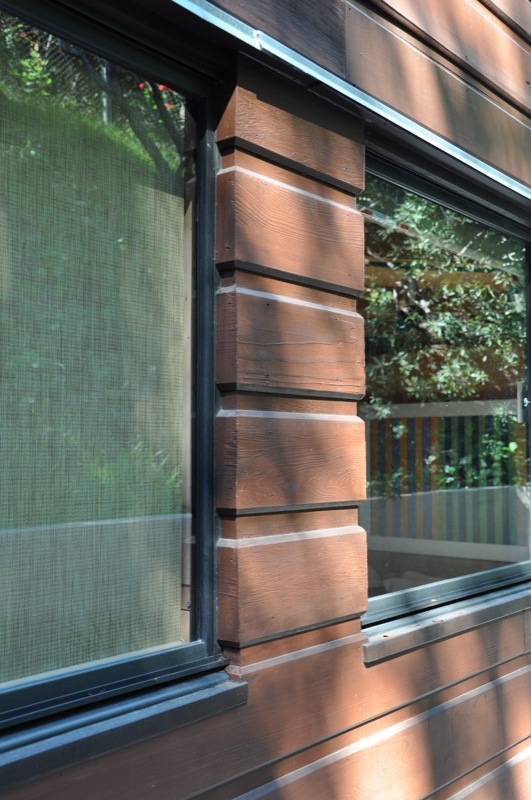 As I approached the front door, I immediately liked the way the wood siding is carefully mitered and turned in at the window and door openings. Typically this would just get covered with trim. 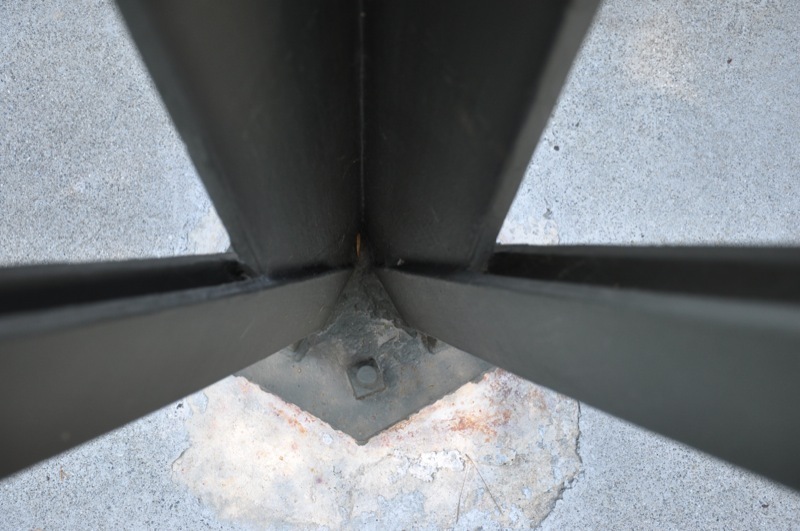 At the interior doorways we see similar attention to detail. 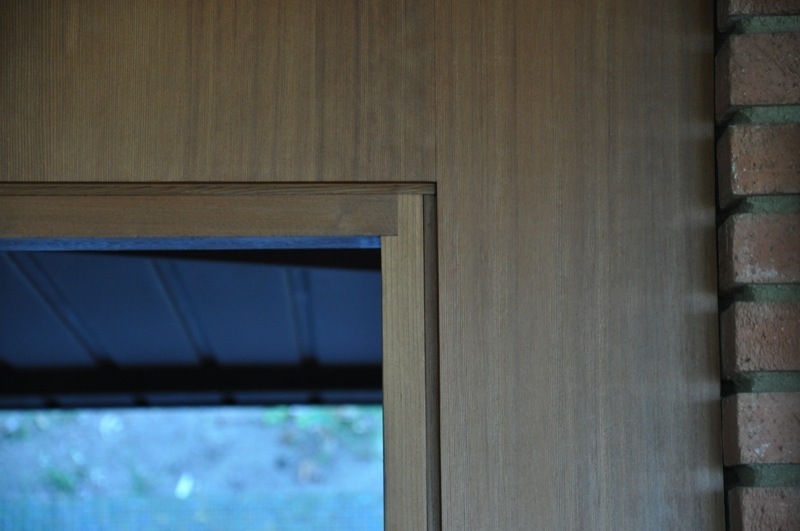 No door trim to hide poor craftsmanship; just beautifully executed craftsmanship that stands on its own. 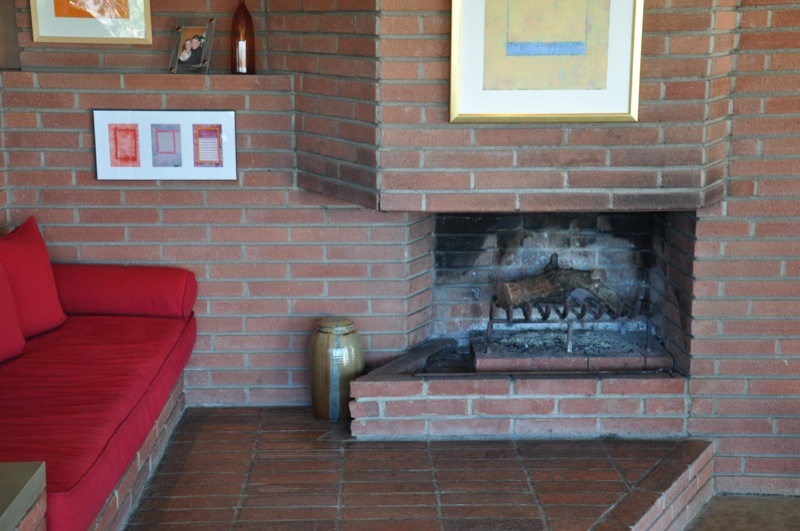 At the center of the house is this elaborate brick fireplace and inglenook. 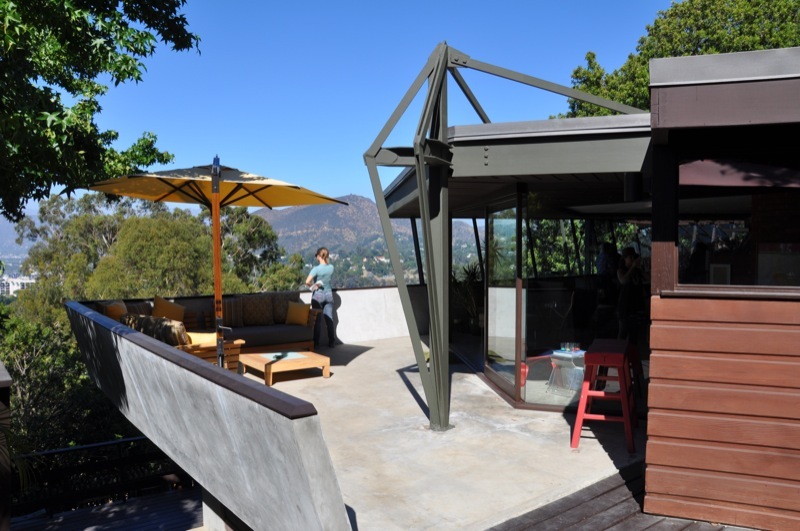 The shaping and placement of it really emphasizes the openness of the house to the patio (shown above) and the view. 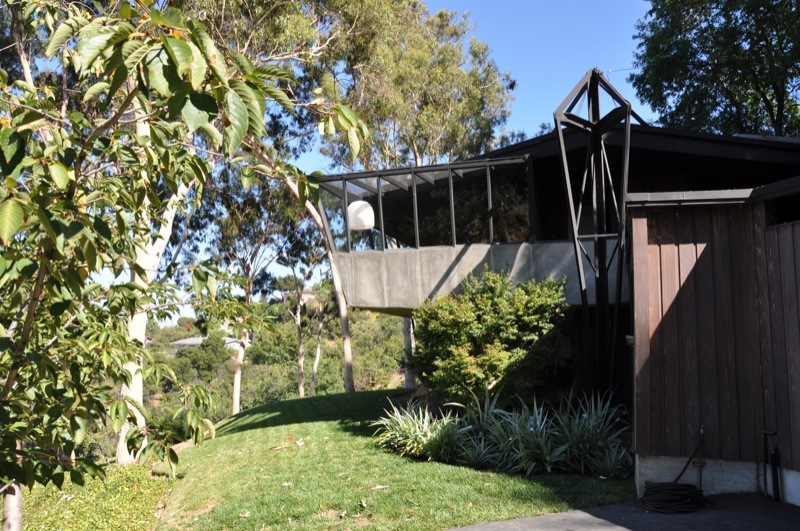 This might look like another view of the Jacobsen house, but it’s actually the house next door, where Lautner employed the same structural system. The two houses share the driveway. 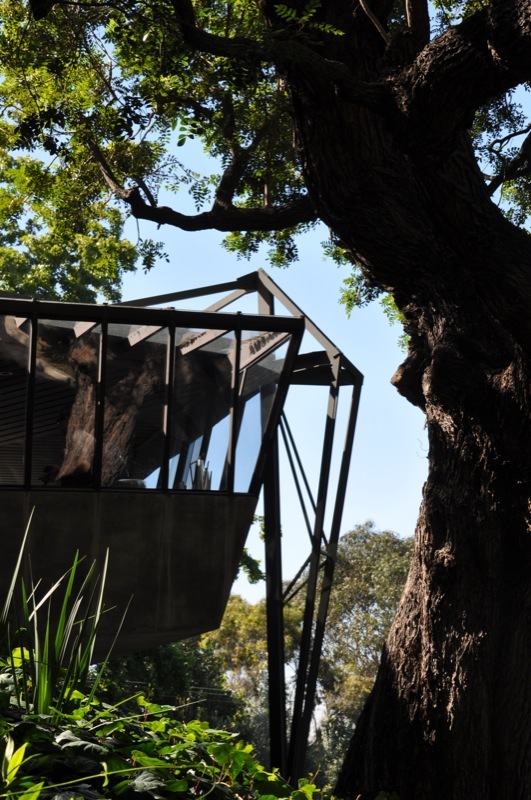 It’s not the tour-de-force that a lot of Lautners are, but it is really a great little house. 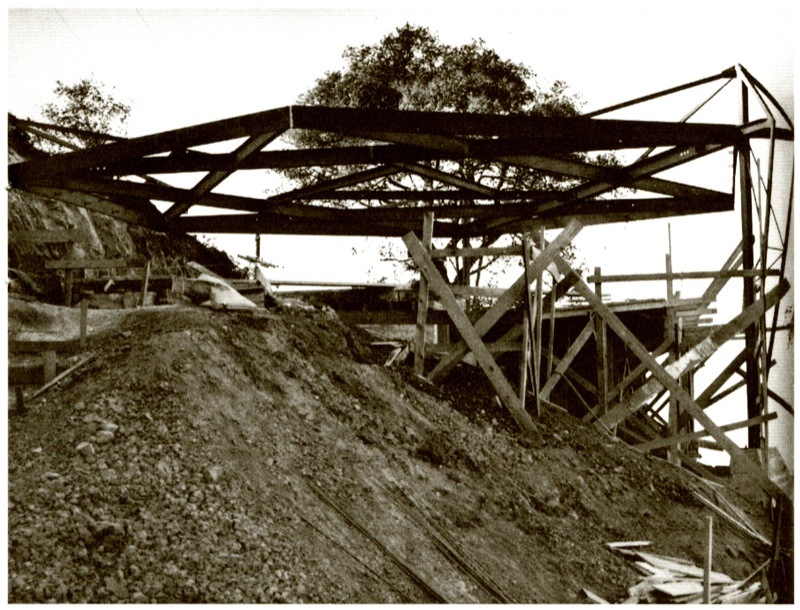 I love how it shows that, from early in his career, he was innovating with the structural systems of even modest projects. Though this particular truss-column system never caught on in a big way, it definitely foreshadows his later successes, where he was able to minimize the structural footprint to such a degree that he could put spectacular houses on steep, previously unbuildable lots. To learn more about Parson Architecture, who we are, and what we do, click here to go to our main website. Sign up to get weekly architecture news and inspiration from the Parson Architecture blog delivered to your email inbox here: http://www.parsonarchitecture.com/signup. We’ll never share your information, and you can unsubscribe at any time. Are you considering building a house, soon or someday? We’ve created a free guide to help you find the right architect for you. You can download it here. 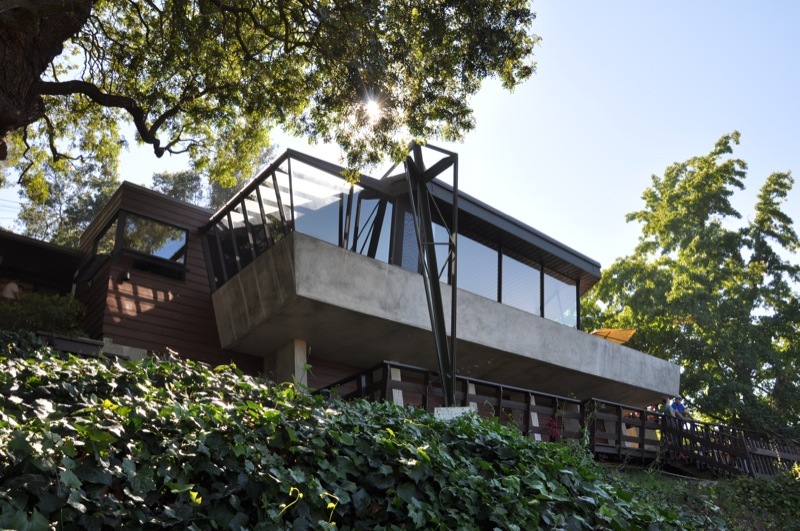 This entry was posted in Building of the Week, John Lautner and tagged Drawings, Lautner, Los Angeles, Steel. Bookmark the permalink. Next postSarasota House: Big Machines! Thanks for the informative description and outstanding photos of this interesting house. I love the “tight” well organized plan. I have a couple of quibbles: he would have done better to use coupling nuts on the base plates instead of the ordinary hex nuts; and it looks like the fireplace doesn’t draw well–it would be a carbon monoxide hazard. Sorry for the criticism, but I have made a living from finding flaws in buildings and I can’t help myself. As a firm believer myself that “anything can be improved” I think these are great comments. Thanks for chiming in!